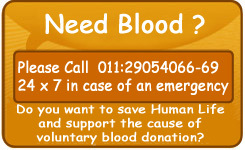 Rotary Blood Bank provides Blood free of processing fee to poor patients. Rotary Blood Bank has adopted children suffering from Thalassaemia (a disease that requires blood transfusion every 3 to 4 weeks) under a special project ‘We Care’, and provides blood free of processing fee for all their transfusions. Rotary Blood Bank issues blood to all patients suffering from Thalassaemia, Hemophilia, Blood Cancer and AIDS at 50% concession on the processing fee, with no limitation on the number of blood units issued under this category. Blood Donor with the Rotary Blood Bank, on production of his/her Blood Donation Card is entitled to get one unit of blood from the Rotary Blood Bank without paying any processing fee for that unit of blood. This offer is extended to the donor himself and his immediate family members (spouse/parents, children and unmarried brothers and sisters) for a period of one year from the date of blood donation. Representatives of Institutions and corporate bodies organizing blood donation camps are entitled to up to 5% of the total number of blood units donated at the camps organized by them, for a period of one year from the last blood donation camp, free of processing fee . Rotary Blood Bank organizes voluntary blood donation camps in and around Delhi to encourage the voluntary blood donation movement. As a result, high quality blood, fully tested against all infections is available to people in life threatening situations. We have a modest processing charge for providing blood/blood components to those in need. 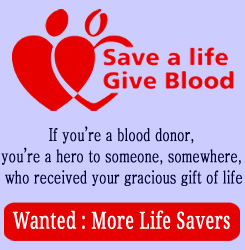 The service charge is intended to take care of running of the blood bank, which includes salary for a staff of 80 persons, cost of donor bags, testing equipment, consumables, electricity charges and several other operational costs.However, any person who cannot afford the processing charge is given blood free of charge.